We are the leading manufacturer of the 20ltr mineral water caps. Our organization is widely known for maintain the product quality in this industry. 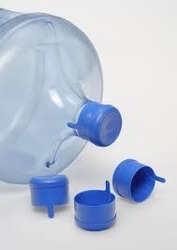 We offer wide range of 20 Ltr mineral water Cap to our valuable clients at industry leading prices. We stringently test our entire products including Plastic Cap at different levels of processing using highly advanced equipments and machinery. Due to our ethical business approach, we have created a long list of satisfied customers in different other industrial sectors. Supplier of food grade plastic products, bottle caps etc.